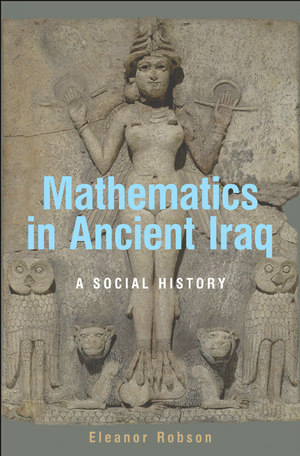 I started Eleanor Robson’s 2008 Mathematics in Ancient Iraq: A Social History two days ago. Not my usual reading. I needed to find out what she had to say on certain issues, but the book was checked out of the library, so I decided, what the heck, I’ll just buy it and give it a try. Through the wonders of Amazon, I had a copy 48 hours later, and I’m glad. The region of modern-day Iraq is uniquely rich in evidence for ancient mathematics because its prehistoric inhabitants wrote on clay tablets, many hundreds of thousands of which have been archaeologically excavated, deciphered, and translated. Drawing from these and a wealth of other textual and archaeological evidence, Robson gives an extraordinarily detailed picture of how mathematical ideas and practices were conceived, used, and taught during this period. She challenges the prevailing view that they were merely the simplistic precursors of classical Greek mathematics, and explains how the prevailing view came to be. Robson reveals the true sophistication and beauty of ancient Middle Eastern mathematics as it evolved over three thousand years, from the earliest beginnings of recorded accounting to complex mathematical astronomy. In recent years, some of Neugebauer’s analyses and conclusions have been re-examined, with new interpretations given for individual tablets and, more broadly, the purpose of the entire enterprise. This is what I have been learning about in the last week, most notably through the writings of Jens Høyrup and Eleanor Robson. has gathered together a remarkable selection of Old Babylonian tablets from the collections of three universities — Columbia, Yale and the University of Pennsylvania — that cover a wide mathematical range. 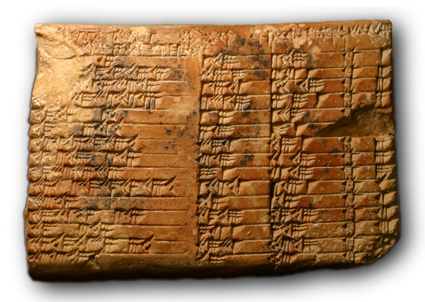 Made between 1900 and 1700 B.C., they include student exercises, word problems and calculation tables, as well as more abstract demonstrations. Under the curatorship of Alexander Jones, a professor at N.Y.U., and Christine Proust, a historian of mathematics, the tablets are used to give a quick survey of Babylonian mathematical enterprise, while also paying tribute to Neugebauer, the Austrian-born scholar who spent the last half of his career teaching at Brown University and almost single-handedly created a new discipline of study through his analysis of these neglected sources. Only about 950 mathematically oriented tablets survived two millenniums of Babylonian history, and since their discovery, debate has raged over what they show us about that lost world. Every major history of Western mathematics written during the last 70 years has at least started to take Babylonians into account. Plimpton 322 reveals that the Babylonians discovered a method of finding Pythagorean triples, that is, sets of three whole numbers such that the square of one of them is the sum of the squares of the other two. By Pythagoras’ Theorem, a triangle whose three sides are proportional to a Pythagorean triple is a right-angled triangle. Right-angled triangles with sides proportional to the simplest Pythagorean triples turn up frequently in Babylonian problem texts; but if this tablet had not come to light, we would have had no reason to suspect that a general method capable of generating an unlimited number of distinct Pythagorean triples was known a millennium and a half before Euclid. Plimpton 322 has excited much debate centering on two questions. First, what was the method by which the numbers in the table were calculated? And secondly, what were the purpose and the intellectual context of the tablet? I sure wish I took an interest in this subject three years ago. I could have read Robson’s book, then arranged for us to be in New York during the exhibition. Compared to the difficulties of grappling with fragmentary and meagre nth-generation sources from other ancient cultures the cuneiform evidence is concrete, immediate, and richly contextualised. We can often name and date individuals precisely; we have their autograph manuscripts, their libraries and household objects. This opens a unique window onto the material, social, and intellectual world of the mathematics of ancient Iraq that historians of other ancient cultures can only dream of.